This post is, right now, just a piece of fiction. - a What If? scenario of events that could lead to the collapse of the United States as we know it. Think of it as a form of war gaming, imagining and planning for unlikely, but not impossible, events. I do not claim these events will unfold in this manner, and I certainly have no special knowledge of the future. But, for the first time in my life, a collapse of Constitutional rule in America is imaginable. It is November, the Monday before the election. At this point, all polls show an extremely tight race, with most of them pointing to a victory by Hillary Clinton. But all polls, even those with Clinton winning, are within the margin of error. Despite this fact, most pundits in the media are confident of a Clinton victory on Tuesday. Tuesday dawns, and voting begins. Despite the heated rhetoric of this election, voting is going smoothly almost everywhere. There are a few scattered anti-Trump and #BlackLivesMatter demonstrations, but these are all small and relatively peaceful, nothing more than some shouting and pushing. There is a report of a couple of bottles being thrown at police at one BLM demonstration, but no arrests were made. Its 8pm. Voting ends in a number of east coast states. The press is eager to report the results, but they are slow to come in. Finally, the first two states are called - one for Clinton, one for Trump. No surprises. Then a couple of more states are called, both for Trump. A mild surprise, as Clinton was expected to eek out a narrow victory in both of those states. Then NC is called for Trump, where he wins by a comfortable 4-point margin. Its 9pm. More polls close, including the western counties in Florida. 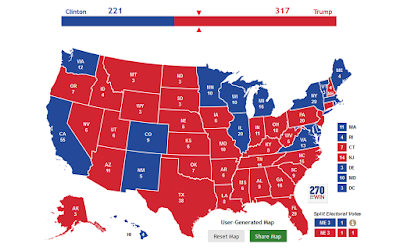 A few more states are called for Clinton. These are mostly small, northeastern states where she was expected to win. But the votes was surprising close. Then the shocker: Florida goes for Trump, and by a surprising 4-point margin. A couple of more states are called for Trump. Virginia goes Clinton, but by only a single percentage point. Clinton also wins New York, but by a razor-thin margin of less than one percentage point. Its 10pm. More polls close. More states are called, mostly for Trump. At this point, Trump has won all the states he was expected to, plus a few that Clinton was expected to win. He has also won both NC and FL. Panic is starting to set in at Clinton HQs, and at MSNBC. Pundits on every network appear shaken, but many are sticking to their Clinton Wins predictions, pointing to the fact that Pennsylvania still hasn't been called. The vote tally there is being incredibly slow in coming in, but Trump is holding on to a small lead. Trump wins big in Texas. Ohio is called - Trump by 3 points. Colorado is called. Clinton wins by less than 2,000 votes. The Trump campaign immediately calls for recount. But it is starting to look like Trump will win even without Colorado. Its 11pm. More polls close. Only Alaska and Hawaii remain open. Alaska is expected to go Trump, and Hawaii almost certainly will go Clinton. Several more states are called, all for Trump by narrow margins. Pennsylvania is finally called - Trump by 2 points. California goes Clinton, but by a surprisingly narrow 2 points. Another shocker: Oregon goes Trump. 11:25pm. Its over. Even if Trump loses the Colorado recount, he'll still win the election. Finally tally, after AK & HI go as expected, is Trump 317, Clinton 221. Wednesday: Trump has stunned the Political Class by winning the election, and winning it by a big margin. But the #NeverTrump crowd won't go away. Overnight and on the early morning shows, a number of pundits start speculating on other ways to deny Trump the White House, mostly centering on stopping him the the electoral college. Two Texas electors had already announced prior to the election that they wouldn't vote for Trump even if he won Texas. The #NeverTrump crowd hopes to convince/pressure other electors into doing the same. 9:20am. News breaks that officials in Pennsylvania are refusing to certify their election results, citing the need to investigate "slow returns" and other "irregularities." Within the hour, rumors start spreading that several other states will hold up certifying their elections for similar vague reasons. By the end of the day, two other states in addition to PN will announce they won't certify. 10am: The DOJ announces an 11am news conference. Shortly after, Hillary Clinton "retracts" her concession speech, saying that "We must allow the legal process to work in full to protect th integrity of the election." 11am: The DOJ postpones its news conference to 1pm. 1:35pm: The DOJ news conference finally begins. AG Loretta Lynch announces that the DOJ is filing papers in Federal Court as she speaks, to overturn the election results in NC, because of "voting irregularities and civil rights violations." Lynch goes on to say that the DOJ is also investigating elections results in five other states, and may take action to overturn elections results in those additional states. She refuses to answer questions about the specifics of what the alleged violations actually are., and claims that it is "pure coincidence" that the DOJ is only investigating the election results of states won by Trump. Later that afternoon, both Mitch McConnell and Paul Ryan both give interviews saying that the American people should "trust the legal system" and that the "situation will be resolved fairly." Both men avoid taking a strong stand for either Trump or Clinton. Reince Priebus emerges from a late afternoon meeting with GOP leadership and announces his support of Donald Trump and decries the DOJ's attempts to interfere with the election, but goes on to say that the GOP is basically out of money after an expensive election and that Trump cannot expect much help with the coming legal battles. 4pm: Trump holds a press conference at which he blasts the attempts to steal the election from him. He accuses the #NeverTrump crowd, the Clinton campaign, the DOJ, and establishment Republicans of colluding together to deny him his victory. The mainstream media focuses on Trump's use of foul language at the press conference, and spins Trump's complaints as "paranoia and conspiracy theories." A number of MSNBC reporters speculate on-air that Trump may be having a "mental breakdown." Over the coming weeks, the Trump campaign loses numerous legal battles as Federal judges, mostly Obama appointees, and many with ties to Clinton, rule against him with only little pretense of following established law. The vote by the Electoral College is delayed due to the ongoing legal battles. Finally, the first case reaches the Supreme Court. In a shocking 5 to 3 decision, with Chief Justice Roberts inexplicably siding with the majority (a replay of the Obamacare decision), the Supreme Court upholds the overturning of the NC election. Justices Thomas, Alito, and Kennedy all write scathing dissents, but Thomas is especially critical not only of the majority decision, but of Chief Justice Roberts in particular as he carefully points out the many points of intellectual dishonesty and hypocrisy of Roberts. This leads to Roberts publicly attacking Thomas' intellect in a rare interview given to CNN. In turn, Thomas suggets that Roberts' inexplicable rulings in both the Obamacare case, and in overturning NC's election results, can only be explained by either bribery or blackmail. This public feud between Roberts and Thomas ends within days with thee resignation of Thomas from the Supreme Court, leaving Alito as the only true conservative, and Kennedy as the only honest moderate, on the Court. All future Supreme Court decisions regarding the 2016 election will end 5 to 2 against Trump. Ultimately, it is decided (unconstitutionally) that the Electoral College cannot be held, and that the election must be decided in the House of Representatives. At this point, Trump has neither the influence nor the money continue to battle the Establishment. It goes to the House. During this time, Hillary Clinton remains generally unpopular with the American people, who overwhelmingly still don't trust her. She also has a couple of "incidents" which once again bring her deteriorating health to public attention. Several House leaders on both sides suggest that they are not bound to choose between the candidates that ran, but my choose anyone as the next President. A number of Republican and Democratic politicians began jockeying for position as alternatives to Clinton & Trump. It gets quite ugly. It also quickly becomes apparent that whoever the next President will be, it won't be Trump or Clinton. Obama announces that, since the House will be unable to vote for the President before Inauguration Day, he will remain in office until such time as a suitable President is elected by the House. He also seems to imply that if he does not approve of the one chosen as his replacement, he might refuse to accept that person, and sue in Federal Court to reject whoever the House elects. And since Obama loyalists run both the DOJ and the Supreme Court at this point, and with Congress in complete disarray, there will be no chance to stop an Obama power grab should he attempt to do so. During all this, there will be chaos, and even violence. Angry Trump supporters will protest. Anti-Trump folks will demonstrate. #BlackLivesMatter will march in the streets. And the usual assortment of anarchists and malcontents will take advantage of the unrest to brew more unrest. In some places violence will occur - rocks will be thrown, police attacked, stores looted, neighborhoods burned. Even though virtually all the violence will come from the Left, Trump and his supporters will receive the majority of the blame in the media and among the political class. The civil unrest and the political uncertainty will cause financial markets to tank. Lending will grind to a halt much like it did in 2008. The economy, already precariously balanced, will fall into another deep recession. Large-scale lay-offs and downsizing will return. A distracted and deeply divided congress will be unable to act this time (actually, probably a good thing in the long run), adding to the uncertainty and chaos affecting the markets. The GOP controlled congress will be blamed by Obama and the media. The Fed will act but cutting interest rates, eventually going into negative rates. This will disproportionately hurt savers such as retirees and others on a fixed income. The dollar will decline, but not as sharply as some might expect, at least not at first. Later on it may be a different story. Inflation will become an even bigger problem for the average American. August, 2017. Congress is in shambles. The House has failed to elect a new President. The Supreme Court remains hampered with two vacancies. Obama remains in office, and remains relatively popular with about a 50% approval rating, perhaps because he seems like the only steady hand in a government that otherwise has completely fallen apart. Tues, August 22. 9pm. In a televised speech from the Oval Office, Obama, sounding quite heart-weary, announces his decision. Due to the incompetence of Congress (which he manages to squarely blame on the GOP), and the ineffectiveness of a short-handed Supreme Court (which he again squarly blames on the GOP), he has only once choice. The government of the United States under the current Constitution must be disbanded. Both Congress and the Supreme Court are dismissed from service. A new Constitution, to be drawn up by a select committee that Obama himself will appoint, will go into effect in two years time. Until then, Obama will remain in office and the executive branch under him will assume the responsibilities of the other branches. AG Loretta Lynch will decide all cases that previously would have gone to the Supreme Court. And Obama himself will issue any new laws needed by executive order. First, the chaos was blamed on Trump. And the press and the #NeverTrump crowd dutifully supported that narrative. Then, Obama began blaming the GOP in general, not just Trump. He pointed to Congress' failure to appoint a Supreme Court Justice to replace Scalia after his death. He blamed Thomas for his "temper-tantrm" and resignation. He blamed Congressional Republicans for refusing to work with him. The press dutifully supported placing the blame on the GOP. And, by this point, the #NeverTrump crowd had become utterly unimportant. Finally, in a master stroke, Obama blamed the "Old Order," "backwards values and traditions," and the "outdated" Constitution for America's chaos. The press dutifully reported it as so. And the American people, dumbed-down, sacred by the chaos, and desperate for some stability, buy it. Most Americans are glad, at this point, that somebody is finally taking charge, and doing what is "necessary"to restore order and safety. Polls show that the Obama Plan to create a new government has nearly a 65% approval rating. 1- I believe that the time period from now until Inauguration Day is an especially perilous time for America, regardless of the outcome of the election. Be especially vigilant during this period. Pay attention to the news. Watch the actions of the political class. Think though what they say, and what they don't say. Read between the lines. Don't trust the media to report honestly. Be skeptical. Investigate for yourself. Use commonsense. And THINK for yourself. 2- Expect civil unrest and violence, regardless of how the election goes. Expect a LOT of civil unrest and violence should Trump win. The best response to civil unrest and violence is to avoid it, if at all possible. It could happen anywhere, of course, but the most likely targets will be big cities, especially inner cities & economically distressed areas, political centers, college campuses, etc. Stay out of, and far away from, bad neighborhoods. 3- Practice situational awareness (pay attention to your surroundings). Be wary of people who look out-of-place, are loitering, or who act nervous. If and when you do go out, try to go out in groups. Avoid bad areas of town. Let people know where you're going and when you'll be back. Park in a highly visible, well-light location near the entrance to minimize chances of ambush & muggings. Don't make yourself a target by wearing expensive, flashy clothes & accessories, or driving an expensive car. Don't make yourself a target by appearing easy-prey - wear practical clothes, walk confidently, head up. Before getting out of a car or walking out of a building, look out a window first to identify possible dangers. Make sure you phone is fully charged at all times. Don't get so involved with your smart phone or I-Pod that you ignore your surroundings. Always be alert. 4- Pay attention to the local news, and be prepared to stay home (Bug-In) if things in your area get chaotic or violent (avoid unnecessary trips to the store, stay home from work and/or school). This means having a store of food, water, and other supplies (such as any medications you take) to last you at least a week, and preferably two or three weeks (pr more), without leaving your home. 5- Depending on your location and what's happening around you, it may become necessary to bug-out at some point, so make sure you're ready for that possibility. Know where you might go. Actually, know at least to places. And know how to get there (at least two routes to each place). Make a Bug-Out Bag packed and ready to go at a moments notice. Make sure your bug-out vehicle is in good running order and is gassed-up at all times. I recommend never letting your gas tank drop below two-thirds full before filling up. 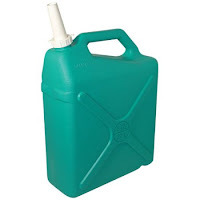 Have some additional gas on-hand, stored safely in containers intended to store gas (I personally have five 5-gallon gas cans safely stored on my property, and I rotate the gas every few months). 6- In a Hillary Clinton administration (or any stolen election scenario), expect guns to be targeted quickly and completely. The Left doesn't just want "commonsense gun control," their end-game is full-blown gun confiscation. The chaos of a stolen election would provide plenty of excuses and opportunities to do so. And a Supreme Court that flips Leftist with the next appointment would allow the gutting of the Second Amendment. Get your guns and ammo now, while you can. 7- The chaos and uncertainty of a contested election, especially one that drags on for months, will tip our economy back into another deep recession. Think fall 2008/early 2009 again, maybe worse. Begin preparing now for mass lay-offs and other financial problems. See my Financial Prepping article for extensive information on preparing financially. Also see my article What To Do Before Losing Your Job. 8- Precious metals - gold, silver, and even copper - will rise steadily, quickly reaching their historic highs and beyond. Lead, in the form of ammunition, will also be a precious metal. Precious metals should be part of your plans if you can afford them, but never at the expensive of making more basic preparations (food, water, etc.). I don't know if a stolen election will actually happen. I do believe there is at least a possibility given current realities, and I don't think Americans are ready for what all that will mean if it does happen. Pray that it doesn't. Prepare in case it does. Stay vigilant. Want a short, bare-bones guide to prepping? Read my article A quick, no frills, down & dirty guide to preparing for the End. TimGamble.com is now on Facebook. Please "Like" me! I want to make my fellow preppers aware of a serious design flaw in the Ozark Trail 6-gal water jugs sold at Wal-mart stores (and perhaps elsewhere). This design flaw lead to 100% of my Ozark Trail jugs leaking within two years. These green water storage jugs have an X-design stamped on two sides. This X-design apparently creates weak spots in the material, eventually leading to leaks along the edges of the X. About two years ago, I bought four of the Ozark Trail water jugs at Wal-mart to use as part of my water storage. I filled them up and put them in a spare bedroom that I use for storage. About six-months later, I noticed that on of the jugs had developed a leak along the X on one side. I had to throw out the leaking jug. Over the next year-and-a-half, all three of the remaining jugs started leaking, all along the same spot - the edges of the X stamped in their sides. This X is a serious design flaw that apparently will eventually cause all these water storage jugs to start leaking. If you have these jugs, you may want to check to see if they are leaking yet. I suggest feeling along the edges of each X for moisture. 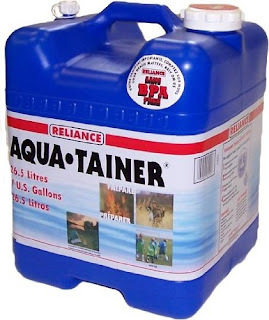 I also have several of the 7-gallon Aqua-Tainers by Reliance. These water storage jugs are actually a couple of years older than my defective Ozark Trail jugs, yet none of them are leaking. I plan on replacing the Ozark Trail jugs with Aqua-Tainer jugs. My older Aqua-Tainer water jugs are still not leaking. Grow a Fall Garden. In many places across the country, August through mid-September is the time to plant your Fall Garden. Crops to consider for the Fall include lettuce, radishes, carrots, beets, cabbage, kohlrabi, turnips, and various greens, including mustard, spinach, and kale. I've already planted beets, carrots, spinach, lettuce, and mixed greens (turnip & mustard) in my garden, and will be planting cabbage this coming weekend. Plant Garlic Bulbs. September is the time to plant garlic bulbs for next year. Consider planting a couple of interesting varieties from the Seed Savers Exchange. Garlic is wonderful for flavoring food, is loaded with nutrients, and may have numerous health benefits, including improving the immune system, reducing blood pressure, protecting against heart disease, and improving cholesterol levels. Harvest Apples. Many areas have u-pick apple orchards. A visit to one would make for a fun and useful way to spend a Saturday afternoon. You can also visit your local farmers' market or attend one of the many small town apple festivals that are typically held in September or early October. Pick Nuts. September through November is the time to harvest pecans and black walnuts. Plant Trees and Shrubs. Fall is the perfect time to plant most trees and shrubs, which means it is a great time to start your own Forest Garden featuring fruit and nut trees. Start Composting and Improving Your Soil. See the article Build Better Garden Soil on the Mother Earth News website. You may also want to check out my article on Composting and Vermiculture. Start Making Your Lasagna Garden. Now is a great time to mark off your lasagna-garden beds for next year, lay down the newspaper, and use the falling leaves and yard waste in the layers. Grow Indoor Herbs. Many herbs, such as chives, cilantro, oregano, basil, mint, and rosemary, can be grown in pots indoors during the fall and winter. I am experimenting with several types of herbs this winter, to see what exactly grows well. Look for a future article giving my results. Transplant Perennials. Fall is the best time to divide and transplant most perennials. Order Seed Catalogs. Don't forget to request seed catalogs for next year from your favorite companies. You can spend the winter months thumbing through the catalogs and dreaming big dreams. Start Researching Greenhouses. Greenhouses are a great way to extend the gardening season even more. Some books you may want to check out: 1) Greenhouse Gardener's Companion, and 2) The Complete Guide to Building Your Own Greenhouse. Are you preparing to help others? Call us preppers or survivalists, we're all preparing to help ourselves and our families during the difficult times ahead. But how many of us are you preparing to help those in need? To help our neighbors who didn't prepare? Or even to help complete strangers? What James is getting at (and please read his entire epistle for yourself - it is short), is that we are expected to live out our faith, and not just pay lip-service to it. James gives three hallmarks of faith that is pleasing to God. One of which is to take care of the poor and needy. We (faithful Christians) are expected to be their guardians. The mark of a Christian prepper, in my opinion, is in our preparations to help not only ourselves and our family or group, but also to help those in need, such as widows and orphans. Think of expanding zones of responsibility. Our first zone of responsibility is to our immediate family. When difficult times come, we don't want to make things worse by being in need ourselves. By preparing and building self-reliance, we not only remove the burden from others of our needs, but are then able to be in a position to help others. This is especially true of men. A man's first earthly responsibility is to take care of his wife and family (his first overall responsibility, of course, is to obey God in all things). One of America's greatest sins in recent decades is the failure of most men to live up to these responsibilities but that is a different article. But we are not to use "taking care of our family" as an excuse to avoid our other zones of responsibility. The second zone of responsibility is to our fellow believers, particularly, of course, those that cannot help themselves, such as orphans and widows. The third zone of responsibility is those strangers, including non-believers, that cannot help themselves for whatever reasons. Note well the Parable of the Good Samaritan. Several years ago, I read or heard about an older couple who are preppers. Even though this couple had no children or grandchildren, they included in their stockpile of food and other supplies many baby items, such as diapers, baby wipes, bottles, and whatever else... Sorry. I don't remember the specifics of what all they stored. I just remember "baby stuff." The point is, these items were totally superfluous to their needs, yet they stored them anyone because they figured that there would be a need for these items by parents unprepared for bad times. Here's another idea taken from a real life example: A church I attended many years ago had a small room where they stored old coats & jackets, blankets, canned and dried food, baby supplies, and other similar things. These were then given to the homeless or other people in need that would show up at the church from time-to-time asking for help. There were no strings attached - folks didn't need to be a member of that particular church, or even have to be a believer, in order to get help. Your church could do something similar - buying and storing supplies that could be distributed to either church members and/or needy folks in an emergency. I know also that there are some peppers who are planning for when distant relatives or friends show up unexpectedly at their homestead or retreat once the stuff hits the fan. Rather than greeting these needy people with a shotgun and running them off, these preppers have taken steps to prepare to accommodate a certain number of folks by storing extra food and supplies, and in some cases even preparing housing for them in the form of campers, trailers, or small cabins on their property. There are actually some You Tube videos of how to turn storage sheds into a small, but very livable, cabins. Another idea, to help those folks you must turn away, is to set up a number of small survival packs to give folks. You can buy small inexpensive backpacks at Wal-mart for less than $10, especially during back-to-school season. Then fill these packs up with a couple of bottls of water, some basic foodstuffs (Cliff Bars or other protein bars, packs of raisins, nuts or seeds, individual foil packs of tuna or chicken, a small jar of peanut butter, etc.). Add an emergency poncho, some basic first aid supplies, matches, toothbrush, toothpaste, soap, washcloth, and other inexpensive items. Check the camping & outdoors section of Wal-mart, as well as the travel-size aisle for inexpensive supplies. I figure you can put together a fairly decent pack survival for under $20. All these are great ideas for preparing to help others in a SHTF situation, and I'm sure you can think of others. But don't forget to help people now, before any collapse or SHTF event. Lots of people are hurting and in need today. Community food pantries, hospices, and crisis centers are always in need of supplies and physical help (volunteers). Faith-based organizations such as the Salvation Army, Samaritan's Purse, Operation Blessing, Catholic Charities USA, and International Orthodox Christian Charities (IOCC), help on a national and global level, are in need of donations and volunteers. Tim's comments: Most everyone is familiar with this teaching of Jesus. In it, we are required to love God above all, and to love our neighbor (our fellow man). But, as the parable makes plain, we are not just to love in the abstract, but our love is demonstrated through action. We are required to help people in need, even if they are not "one of us" or even our supposed enemy (Levites and Samaritans did not get along; they were enemies). Notice that the lawyer, after answering Jesus correctly, asks an insincere question "Who is my neighbor?" This is an insincere question because, as the text points out, the lawyer was seeking to justify himself rather than to learn from Jesus how to be a good neighbor. He wanted to shirk his responsibility from others by excluding some people from the category of "neighbor." Jesus then uses a parable to point out that all people are our neighbors, even strangers and supposed enemies. Germany: Muslim Attack on Church During Easter Service Leaves 24 Injured. This is my EDC pocket folder. I've used it for over two years now and really like it. Great multi-tool to carry in your bug-out or EDC bag. Privacy is important. This website does not secretly collect any personally identifiable information on the readers and visitors. The only personal information I have on you is any information you voluntarily give in a comment or when subscribing by email. The purpose of this website is to provide information and opinion on a variety of topics typically relating to self-reliance. emergency preparedness, wilderness survival, homesteading, gardening, and bushcraft (outdoor skills). It also contains religious content (from a traditional Christian perspective), political & economic content (from a limited government and pro-Capitalism perspective), and educational materials. Email Subscriptions: I do offer email subscriptions, the purpose of which is to notify subscribers of new articles, posts, and updates on this website (which may include advertising). The Email subscription service is provided by FeedBurner, which is owned by Google (governed by Google Privacy & Terms) I will never sell, rent, lease, or otherwise provide your email to any other party. You may unsubscribe to email at any time by clicking the Unsubscribe link at the bottom of the email and following the instructions. Advertising: This website does contain advertising. However all advertising is static, non-personalized. In other words, you see the same ads and links as everyone else. Advertising on this website is NOT personally tailored to individual readers. This website does NOT currently use Google Adsense, and hasn't in several years. This website does NOT use pop-up ads (I hate those myself). If you see any pop-up advertising, it was placed there by your ISP or other third-party without my knowledge or permission. Affiliations: This website is affiliated with Amazon.com. As an Amazon Associate I earn from qualifying purchases. Purchases made through links to Amazon.com on this website help fund this website. Thank You for your support. Disclosure: The owner/editor of this website is not a financial, legal, or medical professional. All information, opinion, analysis, tips, and advice presented are meant only as "food for thought" and a starting point for your further investigation. It is the reader's responsibility to verify everything presented and to carefully consider its suitability for your life and particular circumstances. Copyright 2018 by Tim Gamble. Simple theme. Theme images by enot-poloskun. Powered by Blogger.